NOTE: Barricades went up in national parks across Washington, D.C. Wednesday, Oct. 2, including the Lincoln Memorial. Although President Obama claims that he can’t avoid shutting down public sites and monuments, war memorials were in fact kept open during the 1995/1996 government shutdowns (when Democratic President Bill Clinton was in office). The administration’s decision to barricade the Lincoln Memorial marks the first time in its history the memorial has been totally off limits to visitors during a shutdown. The White House predicted pain, and so they will deliver pain – even when they don’t have to. 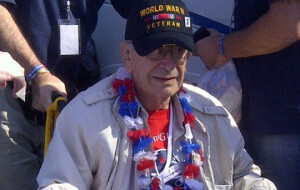 These days, World War II veterans are their targets. … Where are we at as a nation when elected officials are so hungry for power that they would use our last remaining World War II veterans as pawns in a Congressional chess match? It takes a seriously disturbed and demented mind to order government workers to place barricades in front of the National World War II Memorial.